Some time ago, I wanted to develop some new recipes for grilling veggies and plant-based proteins for the summer entertaining chapter of Vegan Holiday Kitchen. * When I first developed grilling guidelines for Vegetarian Celebrations, many more years back than I care to admit, I had a somewhat basic charcoal unit. When it came time to retire this barbecue, I found myself less willing to stand over hot flaming charcoal—and even less willing to putter around with a gas unit. So, I purchased the compact yet roomy (and very reasonably priced) GGR50B George Foreman electric grill. Okay, I know that true grill aficionados might not feel that this is “real” grilling, but it does a good job of quick outdoor high-heat cooking (with those nifty grill marks). It’s a perfect choice for the grill-shy (that would be me, for anyone with a small porch or patio, and for apartment dwellers with only patios and not yards. I ordered the unit from Amazon.com,* and was quite pleased at how much grill you get for about seventy five dollars, which includes sales tax, and if you choose super-saver shipping, there is no shipping charge. This grill would make a really nice gift for Mother’s Day, Father’s Day, for a couple just setting up a household, etc. I’ve gotten a great deal of enjoyment from this purchase, and unlike the charcoal grill, I didn’t feel lazy about the idea of using it for another season. With Memorial Day Weekend coming up, I’m looking forward to another summer of cooking veggies, tofu, tempeh, and pineapple outdoors on this nifty grill. The only drawback to this particular one is that the grill itself is a bit tricky to wash in the sink because it’s pretty big. This year I’m going to try to just bring the dish soap and scrubber outside and rinse it off with a hose. This may not be as much of an issue with smaller electric grill surfaces. George Foreman grills come in many types and sizes. For smaller families or for cooking indoors, there are a number of more compact grills. 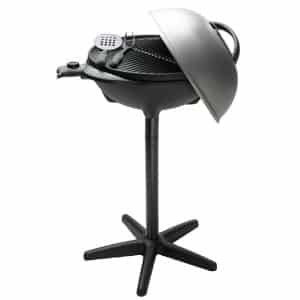 Overall, this grill gives you a lot of value for the price, and is an easy way to cook and eat outdoor for those of us not ambitious enough to use the charcoal and gas kind, for whatever reaason! So once again, the unit being reviewed here is the George Foreman GGR50B Indoor/Outdoor electric grill;* you can explore other George Foreman grills on Amazon, including the very compact and economical Family-Size 60-Square-Inch Nonstick Grill*... and other Foreman grills and products too numerous to list. Read more reviews of products for healthy living in VegKitchen’s Product Guide. 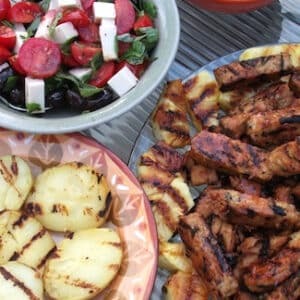 Make sure to explore VegKitchen’s selection of vegan recipes for Grilled Vegetables and Proteins. I just want you to know how much I love this grill. I must have ordered it from your previous review. I had just sold my gas grill island since we’ve removed meat from our diet, but still wanted something to entertain with. We’ve used it for cookout with our meat eating friends and veggies for us and it’s a huge hit. Thanks again!!! Estée, I’m so glad you enjoy it. It really is a nifty little grill for outdoor use for those of us who don’t like to fuss. It’s really perfect for veggies!